The Contract, dated October 30, 1811, states that Rocquebrune will be paid 400 livres for the journey to Fort William and an additional 200 livres for the journey to Rain Lake, payable a month after his return to Montreal. Signed by Rocquebrune, with an X, on his name, written in another hand, at the conclusion of the document. A contract for those essential employees of the early fur trading business – the Voyageurs. These were the often highly colorful men – celebrated in Canadian folklore and music – usually unnamed, who were the critical link between getting furs deep in the Canadian (and upper American Midwest), via canoes on the waterways that could not be accessed in any other way, to trading companies in Montreal. McTavish, McGillivray & Co. was a significant Montreal firm (associated with the North West Company and later Hudson’s Bay Company) which hired the men, outfitted them, sent them out with trade goods, received their furs upon return, and sent them on to the London market for sale. The earliest North American fur trading did not require long distance travel; furs were obtained by trading with Indians, usually near settlements that were accessible by ship. Early entrepreneurs known as Coureur des bois achieved business advantages by traveling deeper into the wilderness and bringing back their furs themselves. The Voyageurs were the crews hired to man the canoes. They traveled along well-established routes. One of the main ones (indicated in this contract) was from Montreal to Fort William on the northwest shore of Lake Superior which was a jumping off point to rendezvous posts (often called portages) in Western Canada. The Voyageurs were expected to be strong. A requirement was that they be able to carry two 90-pound bundles of fur over portages (Some carried four or five) which could be miles long. The zenith of the Voyageurs was the 18th and early 19th centuries. Colorful characters, they travelled in canoes made of birch bark over a wooden frame. Singing was a significant part of their routine (Many travelers reported hearing them sing as they paddled though few songs exist to this day). They embraced hardship or they did not survive. Voyageurs were expected to work 14 hours per day and paddle at a rate of 55 strokes per minute. A typical day began at two or three in the morning unless they were in rapids and they needed to see what they were doing. They stopped for a few minutes every hour to smoke a pipe (Distance was often measured by “pipes”). Twice a day they ate food which they brought with them as there was no time to hunt or fish along the way. Their money was frequently spent on pleasure. For over a hundred years, the Voyageurs were one of the keys to success in the fur trade. Times changed with less demand for furs (and general depletion of supply) and with improved transportation methods. The completion of the Canadian Pacific rail line in the late 1880s finally eliminated the need for long distance transportation of furs by Voyageurs. 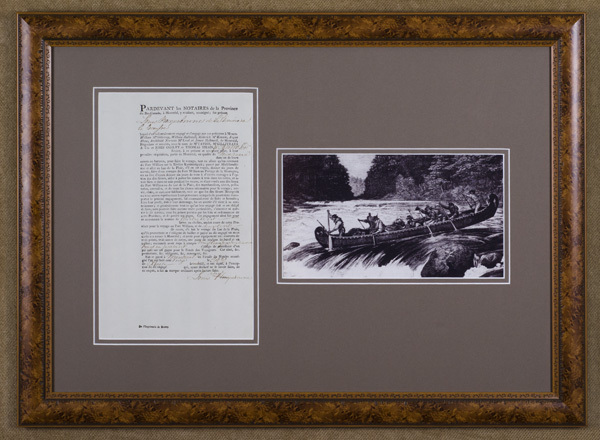 Any document or artifact relating to the Voyageurs is very rare. 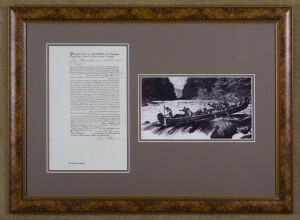 Framed (with brown inner and outer mats, in a Western style wood frame, with an image of the Voyageurs) dimensions: 27 1/8 inches wide by 20 inches high.